Seventy years ago, “The Diary of Anne Frank” introduced the world to an unforgettable voice. Through her diary, Anne Frank illustrated how education engaged and sustained her while she lived in hiding as a refugee in the Netherlands during World War II. This year, the Embassy of the Kingdom of the Netherlands will host the 2017 Anne Frank Award ceremony in honor of two distinctive leaders who are guided by the mission to use education to improve the lives of refugees and those who are threatened. In a ceremony at the Library of Congress on Sept. 14, Father Leo O’ Donovan of the Jesuit Refugee Service/USA will receive the Anne Frank Award and Robert Quinn of Scholars at Risk will receive the Anne Frank Special Recognition Award. Both will be honored for their commitment to advocate for the rights of refugees. Founded in 1980, Jesuit Refugee Service works to ensure that those who have become refugees due to conflict, natural disaster, violation of human rights, or economic injustice have access to education. “Jesuit Refugee Service/USA is thrilled to accept the Anne Frank Award. Anne Frank teaches us many things about the plight of refugees through her example and writings. She teaches us about refugees’ resilience, their humanity, their hopes and fears – all aspects we recognize as we serve refugees in 51 countries throughout the globe. JRS/USA provides refugees with the education, training, and support they need to envision and build a better future for themselves and their communities. We are so proud to be recognized in Anne Frank’s honor and feel privileged to carry on her legacy in defense of human rights,” said Father Leo O’Donovan, SJ, Director of Mission, Jesuit Refugee Service/USA. Robert Quinn and Scholars at Risk will be recognized for their work to protect scholars and promote academic freedom around the world. Scholars at Risk partners with hundreds of universities in nearly 40 countries to arrange sanctuary for scholars whose lives are threatened. Since 2000, Scholars at Risk has helped more than 1,000 scholars suffering grave threats to their lives, liberty, and well-being by arranging more than 900 positions of sanctuary. “Scholars at Risk is honored to be recognized with the Anne Frank Special Recognition Award. Anne Frank’s story is a lasting reminder of the bond between those facing threats and those in a position to help them. Through her writing she not only shares with us the dignity and humanity of those targeted, but reminds us that our own dignity and humanity demand that we do our part to assist those facing hatred, conflict and oppression, wherever and however we can. We are so grateful to the hundreds of higher education institutions and thousands of individuals participating in the Scholars at Risk Network around the world, for stepping forward and helping to support colleagues under threat, especially the many universities and partners in the Netherlands who have done so much to welcome many at-risk scholars. 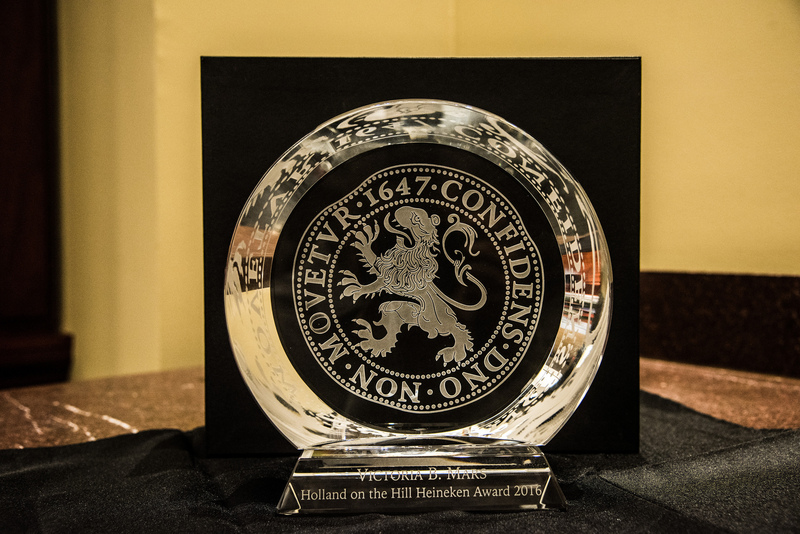 We are proud to accept this award on their behalf and through it renew our commitment to protecting everyone’s freedom to think, question and share ideas, freely and safely,” said Robert Quinn, Executive Director of Scholars at Risk. The Anne Frank Award ceremony will be moderated by Dr. Katrina Lantos Swett, a member of the U.S. Commission on International Religious Freedom and president of the Lantos Foundation for Human Rights and Justice. The Anne Frank Award Ceremony is co-hosted with the Dutch Congressional Caucus, and is part of the embassy’s Holland on the Hill initiative. The Advisory Committee for the Anne Frank Award is the Anne Frank House Amsterdam, the Dutch Congressional Caucus, the Lantos Foundation for Human Rights & Justice, and the U.S. Holocaust Memorial Museum. The award was created in 2014 to honor the legacy of Anne Frank, and keep alive the lessons her life teaches us about tolerance and the importance of defending human rights. The Anne Frank Award recognizes an American or an organization working to confront intolerance, anti-Semitism, racism, or discrimination, while upholding the principles of freedom and equal rights. The inaugural Anne Frank Award in 2014 was presented to Rabbi David Nathan Saperstein, director of the Religious Action Center of Reform Judaism. The Rev. Canon Andrew White was the recipient of the Special Recognition Award. New York Times columnist, Nicholas Kristof was honored with the 2015 Anne Frank Award, while Mrs. Cindy McCain was presented with the Special Recognition Award. Both were recognized for their work to call attention to human trafficking. 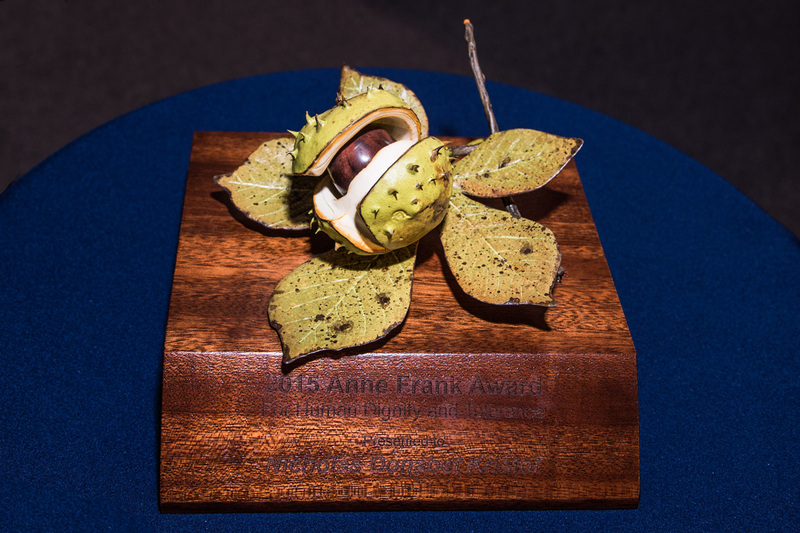 Members of the media are invited to attend the 2017 Anne Frank Award Ceremony on September 14 at 10 a.m. in the Members Room of the Library of Congress. All media must send an email to was-ppc@minbuza.nl by September 12 to RSVP.